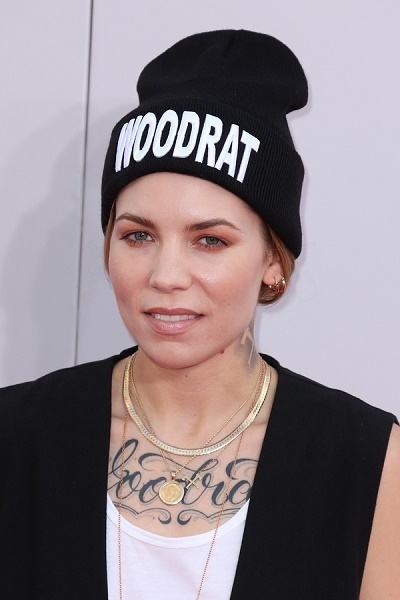 Place of Birth: Mazomanie, Wisconsin, U.S.
Skylar Grey is an American singer and songwriter. She is the daughter of Candice and Gene Hafermann. Skylar’s patrilineal line can be traced back to her third great-grandfather, August Hafermann (December 9, 1835, Germany – September 25, 1919, Wisner, Iowa). Skylar’s paternal grandfather was Earl William Hafermann (the son of Arthur Robert Hafermann and Laura A. Schroeder). Earl was born in Wisconsin Rapids, Wisconsin. Arthur was the son of German emigrants, Friedbert Fridrich Carl Hafermann, of Sellnow (now Zieleniewo, West Pomeranina Voivodeship, Poland), and Ida Hermine Friedrike Schreiber. Laura was the daughter of a German emigrant, Albert Carl Friedrich Schroeder, of Pomerania (now Poland), and of Marie “Mary” Witt, whose own parents were German. Skylar’s paternal grandmother was Florence Esther Berg (the daughter of Arthur August Valentine Berg and Esther Johanna Henschel). Florence was born in Elroy, Wisconsin. Arthur was the son of German emigrants, Edward Michal “Ed” Berg, of Pommern, Rhineland-Palatinate, and Catharina Henrietta Wilhelmina Maria Seebach, of Wesel, North Rhine-Westphalia. Skylar’s great-grandmother Esther was of German descent, and was the daughter of William H. J. Henschel and Frances A. W. Foljahn. Skylar’s maternal grandfather was Burton William Kreitlow (the son of William Arthur Henry Kreitlow and Esther Ingaborg Nelson). Burton was born in Howard Lake, Minnesota. Skylar’s great-grandfather William was the son of German emigrants, August Wilhelm Julius Kreitlow, of Schivelbein, Prussia (present-day Świdwin, Poland), and Paulina Wileminia Goetzke. Skylar’s great-grandmother Esther was the daughter of Swedish emigrants, Måns Nilsson (later Nelson), of Ekshärad, Värmland, and Gertrud Persdotter (later Gertrude Pearson), of Mölnerud, Värmland. Skylar’s maternal grandmother was Doris Josephine Ounsworth (the daughter of Richard Herbert Ounsworth and Eveline Witty). Doris was born in Minneapolis, Minnesota, to English parents from Kingston upon Hull. Richard was the son of Joseph Ounsworth and Matilda Ann Pinder. Eveline was the daughter of William Kemp Witty and Emma Hoy, whose own paternal grandfather was Scottish. Skylar’s paternal line can be traced back to her third great-grandfather, August Hafermann (December 9, 1835, Germany – September 25, 1919, Wisner, Iowa). Skylar’s paternal grandfather was Earl William Hafermann (the son of Arthur Robert Hafermann and Laura A. Schroeder). Earl was born in Wisconsin Rapids, Wisconsin. Arthur was the son of German emigrants, Friedbert Fridrich Carl Hafermann, of Sellnow (now Zieleniewo, West Pomeranina Voivodeship, Poland) and of Ida Hermine Friedrike Schreiber. Laura was the daughter of a German emigrant, Albert Carl Friedrich Schroeder, of Pomerania (now Poland), and of Marie “Mary” Witt, whose own parents were German. Skylar’s paternal grandmother was Florence Esther Berg (the daughter of Arthur August Valentine Berg and Esther Johanna Henschel). Florence was born in Elroy, Wisconsin. Arthur was the son of German emigrants, Edward Michal “Ed” Berg, of Pommern, Rhineland-Palatinate, and of Catharina Henrietta Wilhelmina Maria Seebach, of Wesel, North Rhine-Westphalia. Esther was of German descent, and was the daughter of William H. J. Henschel and Frances A. W. Foljahn. Burton was born in Howard Lake, Minnesota. Doris died in 2017, and was born in Minneapolis, Minnesota, to English parents from Kingston upon Hull. Her mother is 1/32 Scottish through Emma Hoy’s paternal grandfather Hiram Hoy. Also, Burton is now deceased. William was the son of German immigrants August Wilhelm Julius Kreitlow, of Schivelbein, Prussia (present-day Świdwin, Poland), and Paulina Wileminia Goetzke. Esther was the daughter of Swedish immigrants Måns Nilsson (later Nelson), of Ekshärad, and Gertrude Persdotter. Richard was born in Kingston upon Hull, England, to Joseph Ounsworth and Matilda Ann Pinder. Eveline was also born in Kingston upon Hull, to William Kemp Witty and Emma Hoy. Gene’s middle name is Roger.